Finding the pattern and the structure! Trollling eliminates a lot of unproductive water. Still, you can lose lures by trolling and fuel is of course, not free. 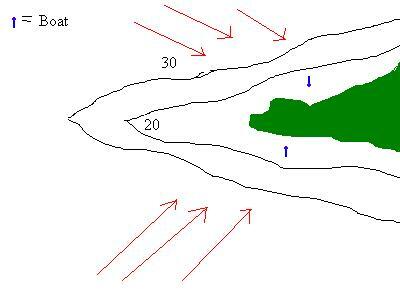 As well, if you have multiple fishermen in the boat, the pattern is easier to find. Once you have found a patch of productive water, stop the motor and cast. Be careful of the trolling motor, even if you cast your lure very far to the side, it will eventually end up right in the path of your outboard, if the outboard is your principal trolling motor. In this situation, hold the rod high. The pattern changes from day to day and sometimes, even hour to hour. It may take sometime before establishing a pattern, still it is possible to eliminate a good number of lures before you even make the first cast. These are very general rules, however. When trolling on a bright day with few waves, use something fast anyway, that way, you can catch a fish and slow down your presentation. All fish relate to some sort of cover all for different reasons. A drop-off, a rocky shoal, a point, a shallow bay are all one of many different types of structure. Here, we will talk about the fish you're after and a good place to start fishing. Timber is good structure for most fish though large and small mouth bass are most notable for structure. Still, a smallmouth will not go for the same type of timber as a largemouth. Smallmouth timber should have thick limbs, the main part of the tree. Largemouth should have thin branches. A topwater, a spinnerbait or a worm or known to work well in timber structure. Rocks are great structure but again, all rock types differ as do fish. Most fish will spawn in gravel therefore in the spring gravel may be your best bet. Large boulders breaking the current in a river are a great spot for Smallmouth in the back of the rock and in front, expect walleyes. Smallmouth spend more time in the rocks than any other species in freshwater. Walleyes prefer deeper rocks of medium-size. Jigs and metal-lipped crankbaits work here. Drop-offs will include most species of panfish, Smallmouth and largemouth but no fish of great size. Shallow wind-blown bays are notable for pike, but don't forget panfish, bass and walleyes may also use it. Stumps will attract pans, bass and surely, many more. Stumps with washed-out roots are better than those with embedded roots(trees that grow in the water) Spinnerbaits are known to work well. So do topwaters. Rocky shoals, adjacent to deep water attract Smallmouth, walleyes, pike and probably many more. Live bait, jigs or metal-lipped baits work well here. What makes a good dock good? And what makes it bad? Many people don't have boats, therefore they are unable to fish many of the structures mentioned above. Still, great fishing is available from some docks. A good dock is either in or close to deep water, has some cover of some sort and offers ample shade. Docks with good shade are prime structures on hot summer days. Let me tell you a story. My grandma's cottage in Midland bay has absolutely no good cover nearby and the nearest drop-off is 100 yards away. Therefore, good fish are not nearby. But on the other side, docks only a few feet long will already be in 10 feet of water surrounded with weeds. Therefore, the other side has better fishing. Boat docks in 6-10 feet of water are prime because they offer ample shade and are in relatively deep water. Let's say that you were to take your 20-foot houseboat and anchor it in 20 feet of water. You fish there for a few days, occasionally going back to shore. After two or three days, a panfish school may begin to associate with your houseboat as cover as it offers shade and yet deep-water is just a dive down. Most bridges are a good fishing spot, especially in the summer. The pilings of the bridge are also good current breaks. No species use the weeds, Largemouth Bass and Bluegills are most notable in lillipads, or perhaps it is the winter and the only weeds considered valuable during the winter are small patches of still living weeds. Once those weeds die, the fish are gone. Smallmouth are known to use Bulrushes, but not lillipads, because the bottom content of bulrushes is somewhat rocky and the bottom content on lillipads is muddy. Smallmouth are also known for using cabbage and sandgrass. Their second choice is milfoil, wild celery and the Canada Waterweed. For bulrush consider a floating minnow, a jig & pig or a small spinnerbait. For cabbage consider Texas-rigged worms, light jigs or slip-sinker live bait. In the sandgrass, a deep-running crankbait is key. When targeting big bluegill or largemouths, heck a big any fish, consider weeds. A great place to start is where weed species may number at two or more and the depths are nearby. This offers ample varied cover, shade and refuge from predators. Still, if given the choice of two weeds. At least one of those weeds should be a surface weed, the other(s) should be submerged. Walleyes occasionally use weeds and lillipads, a grub tipped with a minnow usually works under both conditions. Pike use bulrushes and lillipads, a great way to pull them out is with a fly, and don't expect a small fish either! The wind is an important influence. Tournament fishermen often find places in the practice, when the wind is blowing in a certain direction. The first day of the tournament, the wind's direction and speed may have changed slightly. The spot is probably the same, however. Just move a few yards from where you were originally. When I was trout fishing, the wind only went to a certain point in the pond. You could see the ripples on the water from about 6 ft away from where I was fishing and it continued all the way to the end of the pond. But the water was flat up to 6ft in front of me. The fish were in that first wind-blown area I am certain. Well, thats all but expect an update in the near future.